A single-vehicle rollover crash caused a woman from New Bedford to be killed. The accident happened Tuesday morning, May 1, 2018 on Route 195 WB near mm 38, when a car went off the road. It occurred around 8:45 am in Wareham, Massachusetts. Around 11:00 am, State Troopers responded to the call of a rollover accident. It has been reported that the driver of the car over corrected when the car began to run off the left side of the freeway. The over correction caused the car to rollover at the right side of Route 195. The identity of the victim killed in the crash has not yet been released. The only information we have, is the victim is a woman from New Bedford and 30-years-old. Crews worked diligently to clear the scene, but the right travel lane remained closed for a long duration. State Troopers are currently investigating the cause of the crash. Rollover accidents are some of the most severe type of accident, as they often lead to more serious injuries, often death. Most of the time, rollovers happen with SUVs and Trucks due to their center of gravity and being top heavy. 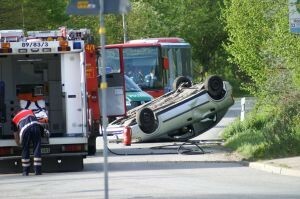 But, thousands of cars are also involved in rollover accidents each year, also causing serious injuries or death. If you have been involved in a rollover accident that caused you to sustain injuries, an experienced attorney is vital to your case and obtaining the compensation you deserve. The legal aspects of your case can be complicated and should be the last thing on your mind. The attorneys and staff at the Law Offices of Jeffrey S. Glassman are here to help you and would like to talk to you as soon as possible to get you the best outcome possible. Call us today at (617) 367-2900 for your free consultation.